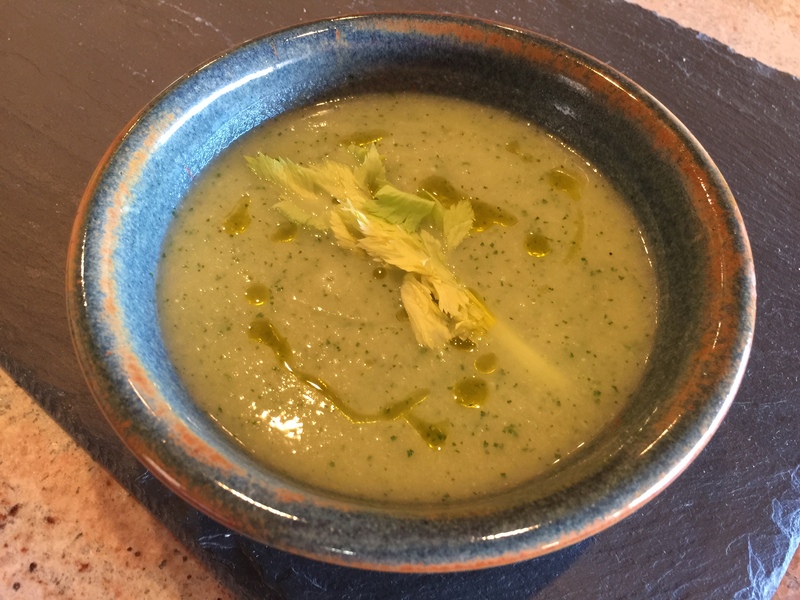 While John was washing windows this morning I whipped up this vegan celery soup for lunch It is really easy and I think it could be done with a variety of vegetables. It is adapted from a recipe for celery soup on the Epicurious website. Their recipe calls for a stick of butter. I used 2 tablespoons of olive oil instead. It also calls for using chicken stock and I used vegetable stock instead. Chop an onion, a whole head of celery, one waxy potato, and 2 cloves of garlic. Cook them in the two tablespoons of olive oil with seasoning until the onion is translucent. Add 3 cups of stock and simmer until the potatoes are cooked, about 10 minutes. Add 1/4 cup herbs and blend or food process until smooth. Adjust seasoning. Serve with a drizzle of olive oil and a celery garnish. Can you imagine doing this with other vegetables? I can! This entry was posted in Vegan, Vegetables, Vegetarian and tagged Celery, garlic, Onions, potato, soup, Vegan, vegetarian. Bookmark the permalink.